Ogden on Politics: Majority of People Supports Roe v. Wade...Or Do They? Majority of People Supports Roe v. Wade...Or Do They? Yesterday I tuned into the Morning Joe political show. The discussion focused on the newly-appointed, not yet confirmed, Supreme Court Justice Brett Kavanaugh. The hosts put up a new NBC / Wall Street Journal poll which showed 71% of the people were against reversing Roe v. Wade, the landmark 1973 case that established a constitutional right to abortion. that the pro-life position on abortion is highly unpopular and it is a winning political issue for Democrats who skew heavily pro-choice. Of course, that overlooks the fact that the pro-life Republican Party have been beating the Democrats at the ballot box us using the abortion issue for 40 plus years. But let's not confuse left-leaning journalists with facts. NBC News reporter Heidi Przybyla appearing Morning Joe program said the notion that Roe established "abortion on demand" is simply a false anti-abortion rights talking point She then decried the possibility, if Kavanaugh is confirmed, that, even if Roe is not overturned, there will be a continued chipping away of abortion rights with the court allowing states to enact restrictions. The "abortion on demand" language may be a pro-life talking point but that does not make it false. 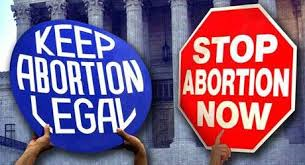 In 1973, the Supreme Court in Roe v. Wade did read into the Constitution a sweeping right to abortion that included unfettered abortion on demand during the first two trimesters of pregnancy. In 1992, Planned Parenthood v. Casey reaffirmed Roe v. Wade, modifying its holding only slightly by replacing the artificial second trimester cutoff point, which no longer approximately reflected viability which had moved to an earlier point due to medical science advances. Casey did allow states to enact more regulations on abortion prior to viability, but only if those regulations did not impose and "undue burden" on the right of a woman to seek an abortion. That means government cannot place "substantial obstacles" that result in any woman wanting an abortion being able to get one. Since 1973, states have tried to pass laws regulating the abortion procedure. Most of these laws are highly popular with the public, but they have been struck down as not being permitted under Roe/Casey. Let's examine some of the latest (May 2018) Gallup polling on abortion. Should abortion be legal in the first trimester: 60% yes, 34% no. Other measures requiring parental consent and informed consent laws are also quite popular although those poll questions were more dated. The highlighted responses are completely contradicted by the actually holding of Roe v. Wade. So then why is Roe so popular? Simple. It is because the general public does not know the sweeping abortion rights Roe v. Wade establishes as required by the Constitution. No doubt those people answering the polls think the decision only provides a very limited right to abortion,. That Roe v. Wade, the one establishing only a limited right to abortion, is the one they want upheld. Unfortunately, that is not the real holding of Roe v. Wade. But Paul don’t you know Abortion on Demand is what Trump used to support?